Other Such Happenings: My map! In my most recent post for HOTM, Teresa in NC asked to see my favorite kind of gravy-- MY MAP! Well, here it is! TADAAA!!! I tried to get Dozer to stand in front of it so you can see just how big it really is... but he was too upset with me. We recently went to visit my sister in NYC and he was very proud to show me exactly where New York was on the little map by our dining table. I tried to show him New York on this map. Bad idea! 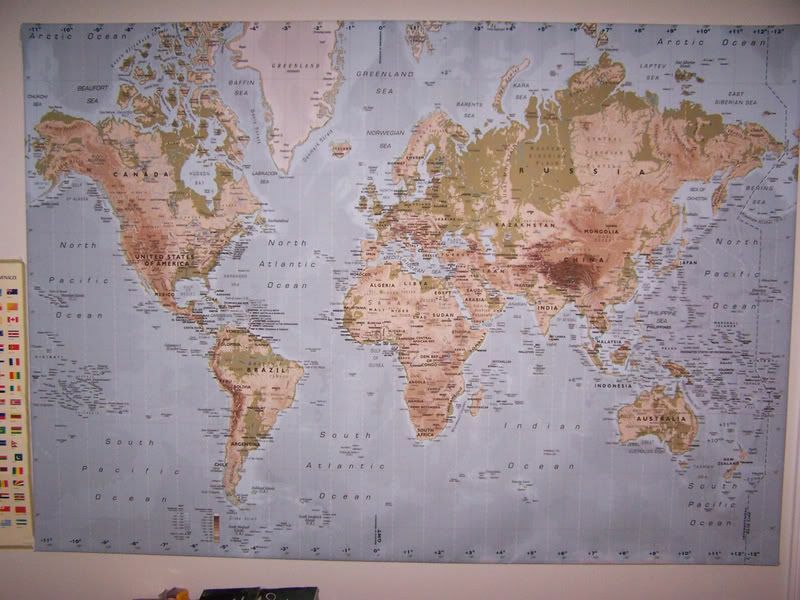 He cried, whined and pointed to the other map. NOOOOO! New Yok is heeeeeahhhhhhhhh!!! NOT thay-er!!! I am not about to argue about this with a 3yo in a Batman suit that desperately needs a nap!